The idea of leaving her career in banking had been floating around in Julie Casey’s head for some time. More time with her only son, Ben, and a change of direction were top of her list. 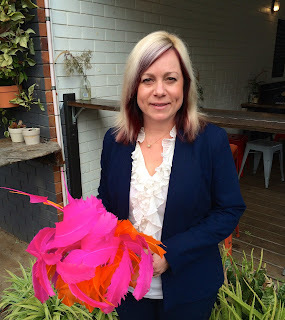 Looking for something to do from home, Julie began testing the waters with a few millinery courses in Melbourne, the epicentre of the trade in Australia. She had begun to enjoy her new creative outlet, but it was a family accident eight years ago that finally forced her hand and cemented her decision. Growing up in Byron Bay, Julie and her husband, Paul, met at high school in Mullumbimby and moved to Clunes to build their own home thirteen years ago. This time of year, leading up to the spring racing carnivals, Julie is at her busiest. There are regular clients who get a hat made each year, plus fashion parades and shops to supply with her striking pieces. “I like to do things that are unusual and different, starting with a base and creating from that”, Julie says. “Generally where we start is the dress, the shoes and the bag.” A customer’s preferences and the properties of the various materials are crucial in the initial design stage, but from then on Julie is relatively free to come up with a one-off design. “You can’t force something to do something it’s not supposed to”, she says of the different materials and objects used in millinery. Feathers, straw, ribbon, silk, lace, felt, netting; some are easier to work with than others. “I do love shaping with feathers because it’s a fairly instant result, you can get something dramatic pretty quickly”. Millinery trends closely follow changes in fashion, but some ideas are slow to shift. For the uninitiated, the traditional spot to wear your hat, or fascinator, or headpiece, or even ‘hatinator’, yes, it’s a word, is on your right temple. Recently, milliners have begun to break away from positioning hats on the side, says Julie, led by British milliner to the stars, Philip Treacy, after he caused a stir with his hats worn in the centre of the forehead by guests at the royal wedding in 2011. Because each hat is a one–off, it’s forbidden to copy other milliners’ creations, Julie says. “To really broaden what you do, you need to do as many courses as you can with different milliners, because they all teach differently and they all teach different techniques they’ve created themselves.” Julie has gathered skills from workshops with many milliners over the years, including well-known Australian milliners Louise McDonald and Neil Grigg. As well as designing and making headwear from her home workshop in Clunes, Julie and her husband have recently bought a joinery business in Lismore, which is taking up a lot of her energy at the moment. It’s part of the family’s future planning, and also another string to Julie’s bow.